(Bloomberg) -- Emerging-market equities have seen renewed investor enthusiasm, but for one Australian firm, the world’s best-performing market is not the place to go. While the Shanghai Composite Index has rallied 24 percent this year, Northcape Capital Ltd. has reduced its exposure to mainland and offshore-traded shares. 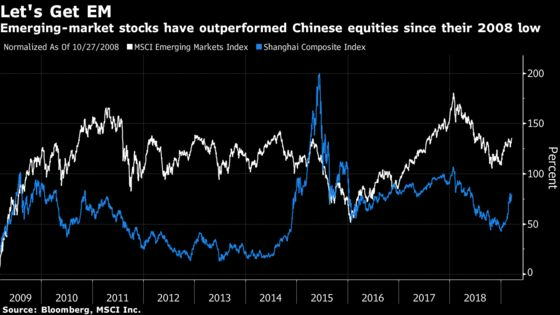 Less than 5 percent of its emerging-market assets are in Chinese equities now, compared with “significantly more” last year, said Ross Cameron, a fund manager at the firm. One of the main reasons for this is that trade negotiations with the U.S. are premised on a stable yuan, meaning China won’t be able to weaken its currency against the dollar to stimulate its economy, Cameron said. In his opinion, optimism around MSCI Inc.’s increased weighting of mainland shares in its indexes -- which market watchers expect will bring billions of dollars to mainland equities -- is misplaced. Instead, Northcape’s fund managers have bought more stocks from South Korea, Indonesia and Brazil, while maintaining their holdings in India and Malaysia. Northcape has two funds that track emerging markets, holding about A$2.6 billion ($1.8 billion) combined. The biggest of them has delivered compound annual returns of almost 14 percent in the 10 years through February, Cameron said. Analytics company eVestment ranked it as one of the top performers among peers over the five years through June. While global growth concerns are a key risk, the Federal Reserve’s pause in tightening will lead to more money flowing into emerging-market assets, Cameron said. Investors of almost every stripe appear to be turning more bullish on them after last year’s rout. But when it comes to China, Cameron is skeptical. The country has amassed too much corporate debt -- he views its recent social-financing data as the “ultimate bearish signal” -- and yet the economy is still slowing. The nation cut its growth forecast to a range of 6 percent to 6.5 percent for 2019 earlier this month. Indian shares remain Northcape’s biggest single exposure by value, with holdings including HDFC Bank Ltd. and Tata Consultancy Services Ltd., Cameron said. The firm is keeping its overweight on Malaysia, betting on stocks such as Malaysia Airports Holdings Bhd, Public Bank Bhd and Top Glove Corp.
South Korean cosmetics makers, such as LG Household & Health Care Ltd., because of increased urbanization and low impact should the U.S. fall into a recession. The firm is also looking into memory chipmakers like Samsung Electronics Co. and SK Hynix Inc. as the companies focus on profitability and their stock valuations are low. Indonesia’s PT Bank Central Asia on the premise that Joko Widodo will be re-elected as president and low interest rates will more than compensate for narrower net-interest margins. The nation has “a lot of room” to cut interest rates, Cameron said. Brazilian banks and consumer staples on expectations President Jair Bolsonaro will be able to reform the country’s pension system. “Emerging-market equities except China will be a very profitable hunting ground for stock pickers,” Cameron said.